Lifestyle Projects - Elaine's Custom Sewing Inc. When work takes you out of the office. As our location here at the port of Sanford is close to the St. Johns River and Lake Monroe, we get lots of requests for boat related custom work. This boat project was very challenging and at the same time very creative. The outdoor environment in Florida is extreme and so it goes with the materials that must be used. The result came out super, the customer was delighted and in the end that's what we aim for. In this golf-cart project, the customer wanted a really unique piece of custom sewing and upholstery. The project was intended as a birthday present, the timeframe was short and we knew that the work was going to be examined in detail. We delivered a striking yellow and white vinyl finish with an individual motif. 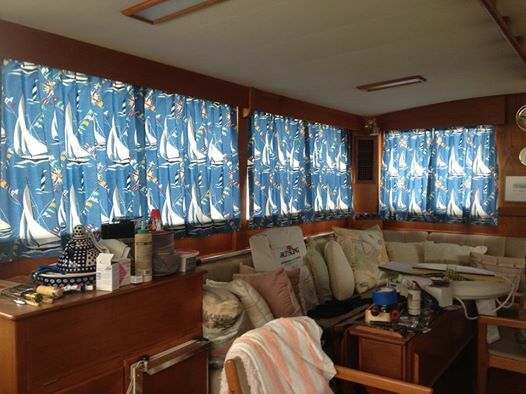 In this Sanford boat project we worked on window coverings. The boat called for some major updates. The customer wanted a marine theme and choose the window material himself. The materials had to be lined and UV light resistant because of the exposure to the sun and to the water based location. Our work on the soft furnishings helped transform the boat into a real beauty. Florida has more than its share of RV sales outlets. Some RV's need to be refurbished. There are several large outlets along the I-4 corridor, from Deltona down to Kissimmee. These RV's come in all sizes, and the larger ones can be luxurious home away from home. Owners and Sales Managers know the value of showing an RV in it's very best condition and so here at Elaine's we get several custom sewing projects per year. In this sample RV Project, I did the custom pillows. The results had a really luxurious impact on the living space.